Our 2018 Rate Sheet is available here for your review. Can I get a copy of the Wedding Contract? Our contract is available by e-mail or by mail, please contact us at our office. How do we reserve the church? Setting t he date of your wedding should be made as far in advance as possible to insure your first choice of date and time. To reserve a date, contact the church office at 831-624-3550 or e-mail us. To confirm your wedding and secure your date here at Church of the Wayfarer, we ask that you send a $500.00 non-refundable deposit to the mailing address listed below. Your deposit must be mailed within 10 days of calling the church and requesting a wedding date. We accept checks, cash or credit cards. Please make all checks & money orders payable to Church of the Wayfarer. To make a deposit or payment by credit card, please call the church office at 831-624-3550. Please do not mail cash. The time and date of your reservation will be confirmed when we receive your deposit. All fees and honorariums must be paid 30 (thirty) days before the ceremony. What is the capacity of the sanctuary? The sanctuary will seat up to 200 guests, but still retains an intimate ambiance for even the smallest of weddings. An adjoining “garden” room may be opened to accommodate an additional 50 guests. Will Pastor Ham perform weddings off site? Yes. Please contact the church office. What does the Wedding Coordinator do? The Wedding Coordinator administers and oversees all wedding activities at the church. Should you choose to bring in an off-site coordinator, the church Wedding Coordinator still oversees all church-related aspects of the wedding. She will assist during the wedding rehearsal, as well as the day of your ceremony. For all large weddings, a rehearsal is recommended, but not necessary. What kind of music can we have at our ceremony? 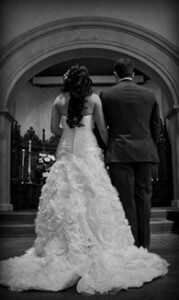 The church organist has a variety of options for preludes, processionals and recessionals, and welcomes a brief conference with the couple in planning the music for your ceremony. The church organist does not attend rehearsals. Guest artists should contact the organist in advance of the wedding to arrange the selection of music. If you are interested in string quartets, pianists or other ensembles/musicians, the organist or Wedding Coordinator can be of great assistance in this matter. Yes. The church asks that photographers be discreet in the use of flash photography, however we understand that this is an important day and the need to capture those special moments may require flash photography. Videography is allowed at the church. The videographer may set up in the choir loft or closer to the altar out of the view of the wedding guests. Please bring all paperwork/documents with you to your rehearsal and give this packet to the Wedding Coordinator, who will take care of the paperwork from there. If you have further questions regarding marriage licenses, please contact the Wedding Coordinator and she may be able to help you. Can I have my guests throw rice, rose petals or birdseed? The throwing of rice and/or birdseed is traditionally done at receptions, however, it is prohibited by the City of Carmel-by-the-Sea. Can my guests smoke inside the facility? Smoking is not allowed in the church building, in the garden or on church property. California law prohibits smoking outside within 25 feet of any doorway of a building where people gather. Are special classes or counseling sessions required prior to our ceremony? Weddings are a ministry of our church. If our pastor can be of assistance to help couples have a happy marriage, please contact him. Can I have my reception at the Church of the Wayfarer? There is a possibility that a small reception could be held at our church either in the Garden Room (40 people) or the Fellowship Hall (100 people). Contact the Wedding Coordinator for more information. What address do I list on my wedding invitations or directional maps? Church of the Wayfarer Corner of Lincoln Street and Seventh Avenue Carmel-by-the-Sea, California. Church of the Wayfarer P.O. Box 2205 Carmel-by-the-Sea, CA 93921. Are animals permitted at my wedding? We welcome our animal friends. If you want them included in your special day it is fine. The aisle is 56 ft. to the end of the pews and 61 ft. to the door. Bows from below the hurricane globes (on the aisle candelabras) is 4’5″ to the floor. Aisles without the aisle candelabras is 4’5″ wide. With the aisle candelabras is 3’10” wide. There are 6 altar candles – included in the wedding package fee. Archway ‘shelf’ for additional flowers is 9″ deep, 19″ in length. There are childcare facilities on the property; you are responsible to hire childcare personnel. Parking is VERY limited. The church does not have a parking lot. We suggest that you recommend to your guest to arrive at least 15-30 minutes prior to the wedding to locate a parking spot. Two-hour spots are located all around the area, and within a block of the church there are spaces with no time restrictions. Maps are available from the Wedding Coordinator that will show areas of paid/garage parking in the area. Two parking spots are included in your wedding package fee and are located directly in front of the sanctuary. This is a large enough spot for one limousine, or two cars. If you want a horse & buggy, or if you have a large amount of guests arriving and you will be using a bus, you must call the Carmel Police Department (831-624-6403) to notify them of this matter. Please refrain from moving any of the podiums in the sanctuary. Sunday Worship: 10AM-11:00 AM/Free childcare for infants and toddlers.